On arrival at the national park we will check in at the wildlife resort. 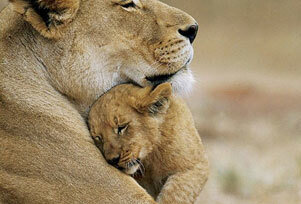 After fresh-n-up & lunch we will ready to enter the Kanha national park for first time accompanying with the naturalist. overnight stay at hotel. Morning jungle safari to the national park, later after breakfast drive to Bandhavgarh National park. On arrival check in at the wildlife resort. Overnight stay at resort. 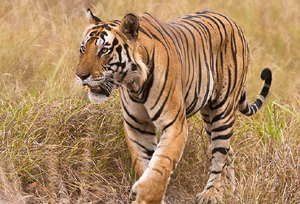 Bandhavgarh Tiger Reserve is mainly known for its Royal Bangal Tigers. 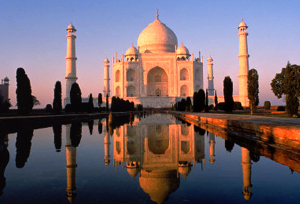 It has a typical central Indian fauna & home of more than 22 species of mammals. Common langur and rhesus macaque represent the primate group. Among the carnivore species jackal, Bengal fox, sloth bear, rattle, grey (small Indian) and ruddy mongoose, striped hyena, wolf, wild dog, jungle cat, leopard and tiger are prominent. Ungulates (animals which walk on tips of their toes) include chital, sambar, barking deer, chinkara, chousingha, nilgai and wild pig. Porcupine, lesser bandicoot and three-striped palm squirrel are among the rodents. Small Indian civet and toddy cat are also found here though seen rarely being nocturnal. Another nocturnal animal, the rufous-tailed hare is also seen usually during dusk. 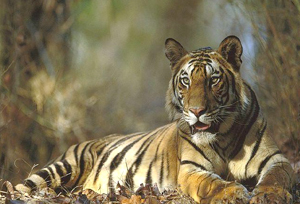 Some of its mammals have been listed as threatened animals by IUCN in their red list like the wild dog, Bengal fox, sloth bear, leopard and tiger. Morning after breakfast city sightseeing tour of Delhi visiting Raj Ghat and Shanti Vana - the cremation sites of Mahatma Gandhi and Jawaharlal Nehru, Jama Masjid and drive past Red Fort and Chandni Chowk, Qutub Minar built by Qutub-ud-Din Aibek in 1199, Humayun's Tomb, India Gate (War Memorial Arch ). Also drive past President's House, Parliament House, and Government Secretariat Buildings & Connaught Place shopping centre. Overnight stay at hotel. Breakfast at the hotel and transfer to the international airport to board the flight for onward destination.